THIS WEEK has once again highlighted to me the importance of not making hasty decisions and how these can cause you more work in the long run. Back in the summer, after much deliberation, but clearly not enough, we decided to bid farewell to our two rams. Torridon, had just fathered all our lambs and did a great job too, he was a family favourite but was causing far too much damage to my gates. Only because he wanted to spend all of his time with the ladies and that was never going to be happening. The second, Rambo, was related to a number of our ewes and so we decided to send him packing too rather than use him this year with our ewes. After several months without them the time had come for us to find a tup to put in with our ewes next month and do you know it’s not as easy as it may sound. Of course I could go and buy another one in, but we decided to hire one in to take care of things for us. We have also had to consider whether it’s time to look at producing a more commercial product for the spring, one which can offer us a larger lamb but with all the benefits that our native Shetlands and Hebrideans have to offer. 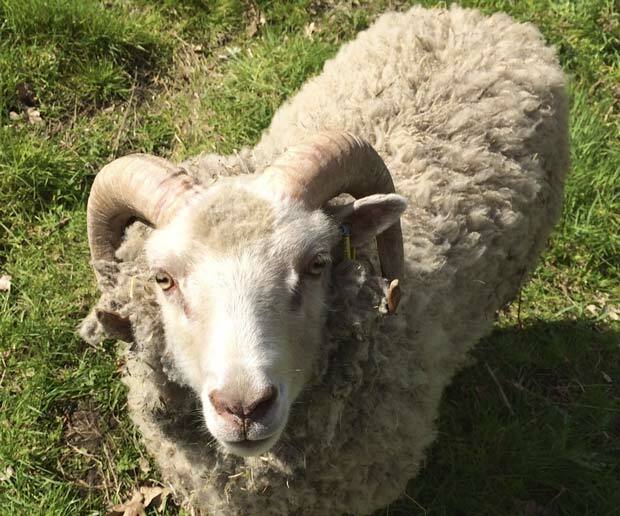 Following much research and discussions with neighbours, farmers, farm shop staff and even our coal man too (who is also farmer, I must add), we’ve decided that a Charollais tup is what we’e looking for. Many hours of internet searching and phone calls later and we managed to find the right bloke for the job. The second hasty decision was made whilst having our new entrance made around six weeks ago. I had the contractors remove our monstrosity of a compost heap and bury it under the landscaping they were constructing around the new road. At the time I was overjoyed, it had created so much space, but I wasn’t aware that our favourite fencer was up to his ears in work. As a result, it meant that he wouldn’t be able to knock posts in for my new compost heap for over six weeks. To say it caused me grief, is an understatement. Wendy has just laughed at my dilemma, because she has seen me stressing out over such a minor issue. The thing is though, that with chickens and goats being cleaned out weekly and ponies being mucked out daily and getting a full clean each Saturday, this creates a heap load of muck to get rid of. As it happens, much of it has been burnt, but the damp and wet weather hasn’t helped me in that regard, because believe it or not damp dung doesn’t burn easily. I will have to consider things like this a little more in the future rather than making hasty decisions just because I’m an impatient so and so. For quite some weeks now I have been witnessing countless birds flying south for the winter. So much about what they go through amazes me, from the flight patterns they use to support each other, the sheer number of birds involved and the thousands of miles they must cover in order to reach their wintering destination. I am regularly amused though to see those birds who appear to have taken a wrong turn and fly around in circles until ultimately they figure out the correct route to take. Sometimes, there are parallels between their misdirection and mine it would seem.